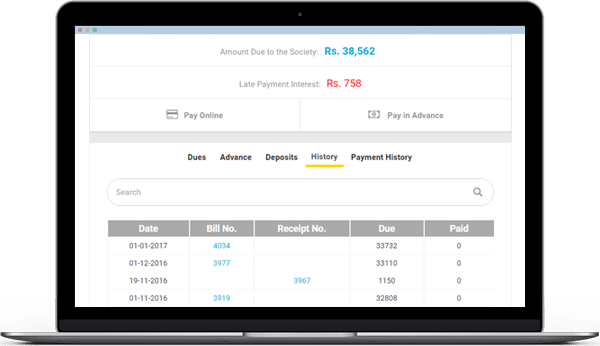 Automatic Invoice generation against each flat for regular, fixed charges - e.g.Maintenance Fee. If applicable automatically post service tax for the Society maintenance fees collected. Supports different Apartment Categories like 2BHK, 3BHK, Penthouse, Serviced apartments - and set charges differently. Easy set up of Income Heads - separate income from residents and income from non-residents. Easy posting of Amount Collected, with generation of e-receipt which can be sent by email, sms or print. Distribute a payment among open invoices or automatically assign the payments on First in-First out principle. Best Part : Late Payment Interest can be automated in a single click. 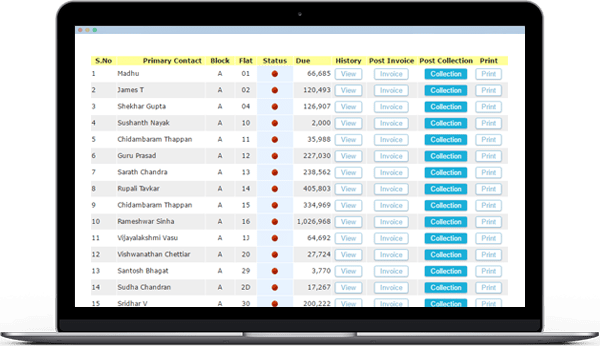 Simple interest gets calculated & posted automatically by the system. No Intervention needed. Once Approved an Invoice can be raised with link to this PO. Graphical reports for Budget comparision. Graphical reports for comparision of Expenses against Previous Years. Easy setup with the help of ADDA team. 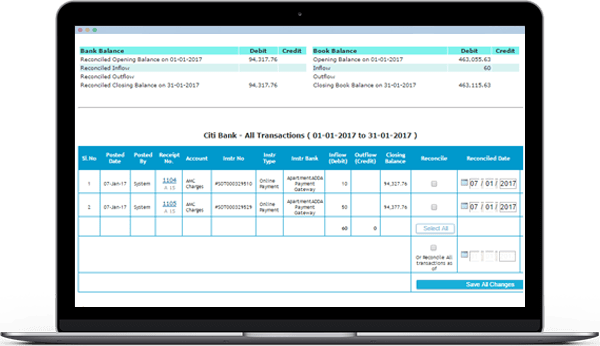 Query transactions from all account heads ( Member Income, Non Member Income, Expenses ) within a date range. 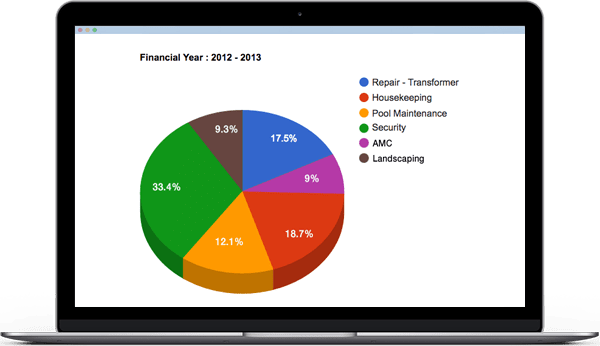 Chart of Accounts to configure Assets, Liabilities, Income and Expense Account Heads all in one place. Trial Balance, Balance Sheet and Profit & Loss Statements with option to export to Excel. 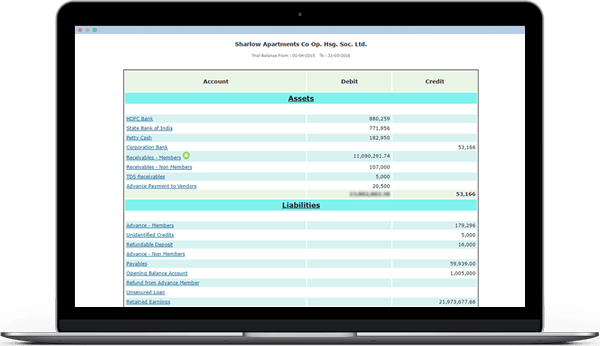 A Resident can view financial details and alerts pertaining to his flat on this Society accounting software. He can view the invoices/receipts against his flat and take printout if required. Can make Payments using Debit Card or Credit Card using Online Payment Gateway. Integrates with hand held meter reading devices. 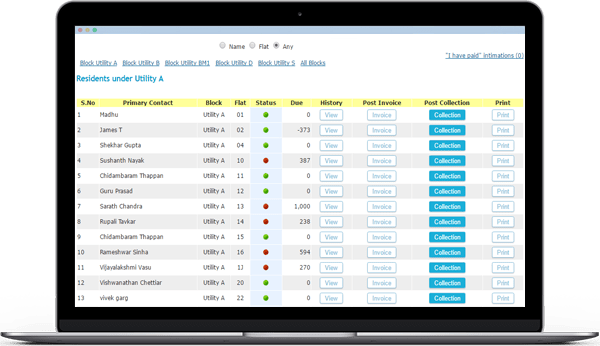 Provision to save Meter Readings, so month on month - just current readings have to be uploaded and system will keep readings up to date.